For fever, headaches, blocked nose, body aches and sore throat.Paracetamol, Caffeine, Phenylephrine Hydrochloride For the symptomatic relief of colds and flu. Directions How to take: For oral use. 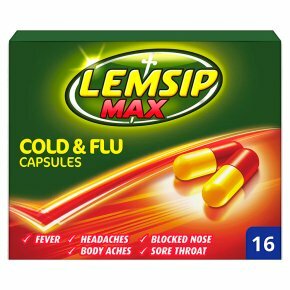 Lemsip Max Cold & Flu Capsules should be swallowed whole with water. Do not chew. How much to take: adults and children ages 12 and over: Two capsules to be taken every four to six hours. Do not exceed 8 capsules in 24 hours. Do not give to children under 12 years old. Do not exceed the stated dose. Please read enclosed leaflet before taking the product. Warnings<br>Contains paracetamol. Do not take with any other paracetamol-containing products. Immediate medical advice should be sought in the event of an overdose, even if you feel well.<br><br>Keep out of the reach and sight of children. If symptoms persist consult your doctor.<br>Do not take if: allergic to any ingredient, if you have heart disease, high blood pressure, overactive thyroid, have had a peptic ulcer, or you are taking or have taken MAOI's (antidepressants) within 14 days.<br>Consult your pharmacist or doctor before taking if: you are pregnant or breastfeeding.